Published: Nov. 18, 2018 at 02:36 p.m. Published: Oct. 14, 2018 at 01:46 p.m. 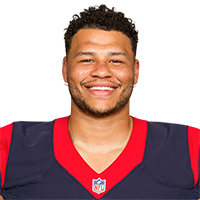 Published: Aug. 28, 2016 at 06:43 p.m.
Arizona Cardinals QB Matt Barkley is strip sacked by Houston Texans linebacker Brennan Scarlett and recovered by Texans defensive end Joel Heath.